For those of you who have no idea who we are (which is no one because you all probably came from our Instagram pages), our names are James Trevino and Elizabeth Sagan. We love reading, writing and evil things (Liz likes fluffy stuff so she is just pretending) and we are also bookstagrammers… meaning we fill our time with taking complicated photos of books for the benefit of mankind. Actually, we do it because our social lives are a mess… which is also a lie seeing how for something to be a mess it has to exist first. But that’s beside the point. With this site we will try to bring to you book and movie reviews, articles on social media and how to grow and lifestyle, giveaways, and behind the scenes from our glamorous (not) lives. And some other exciting things that we can’t talk about just yet. We hope you like surprises. There will also be content every month EXCLUSIVE for those of you that subscribe to our Newsletter… so subscribe to our Newsletter. I’m a huge fan and hopefully you’ll inspire not only me but also others. So exciting! 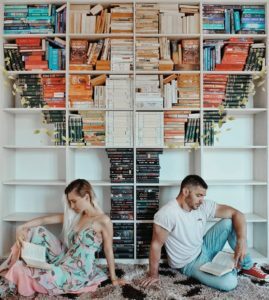 Love your instagram pages as they are so creative, inspiring and of course are all about Books! Curious to see what other ideas you unleash into the world! Thank you so much for creating this site !! I can’t wait to read what you have in store for us! Your imagination is AMAZING!!! You have fun doing this and it shows! That’s the most important thing. Good luck! I’m so exited! I love your work!!! I follow you guys in FB. You recently posted an international giveaway to your followers on instagram. I don’t have instagram, and I don’t know if I should get one JUST for the giveaway but when you guys post giveaways on FB, I’ll without a doubt participate.The last time I won something, was a flat screen TV but it got stolen. I didn’t feel SO terrible because I didn’t even watch tv anyway, it was just a raffle that I wanted to pitch in with. So maybe if I participate in a book giveaway in the future with you guys, robbers won’t think of stealing books because they’re dumb. I don’t remember how I initially found you guys on IG but since then I’ve consistently looked forward to your amazing content that bright up my life, as I’m sure many others too. From the sounds of it, I’m like you in a lot of ways – in the sense that i love to read and write, home to the dark side and without a social life – introvert. I just had to head over here and sign up for the newsletter! Your photos were the one big dress for me but it’s nice that I’m an avid reader too! I’m so excited to read all the content you both will be posting on here. Ahhh!! This sounds amazing! I love James and Liz! Good Luck guys! So very excited for your new content !! Love the site so far! Great job! I can’t wait to see what you two have in store for us all!